Minnie has shown a real interest in foxes recently! She's been keenly finding out about their habitat etc, & searching the books on her bookshelf to find stories about them. 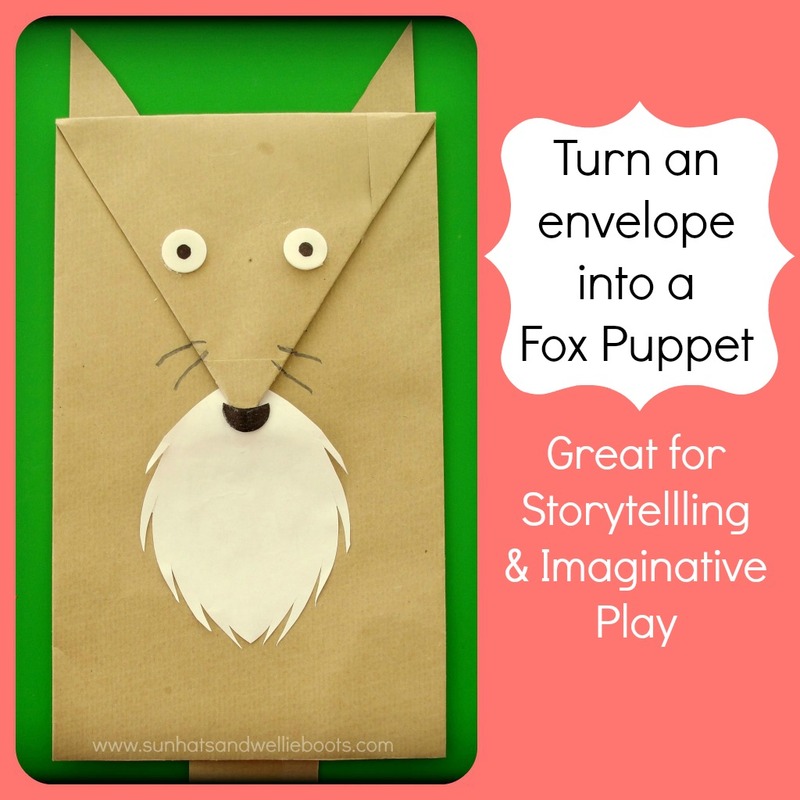 The other day she asked if I could make a fox puppet, so after a little hunt through our craft box we came up with this upcycled fox character made almost entirely from one brown envelope. Here's a rough rundown of how we made our puppet, hopefully, these pics will help me explain. (2) We then folded both corners into the middle, so they were an equal size. (3) To make the fox's nose we cut off the folded corner sections. For a neat finish, we didn't cut along the fold but left an edge so we could tuck this under in the next step. Keep the triangular cut offs as these will become the ears! 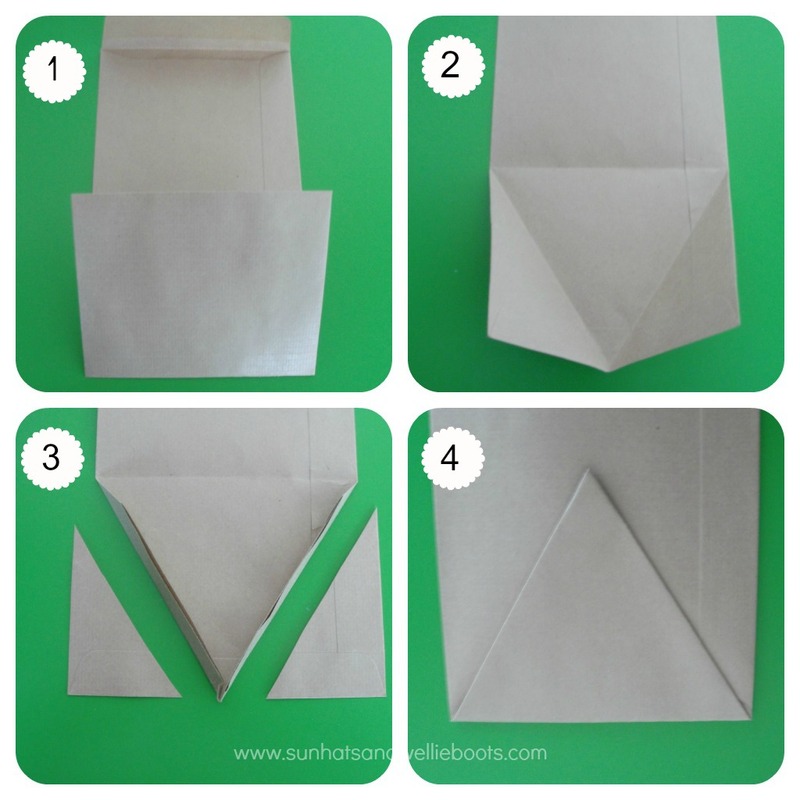 (4) Using double-sided tape to secure we tucked in the raw cut edges & folded over to make a large triangle. 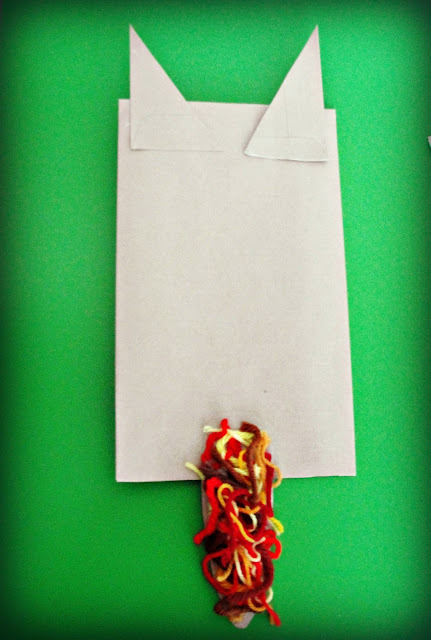 (5) For the ears we used the two cut offs (mini triangles) & secured these to the back of the envelope. 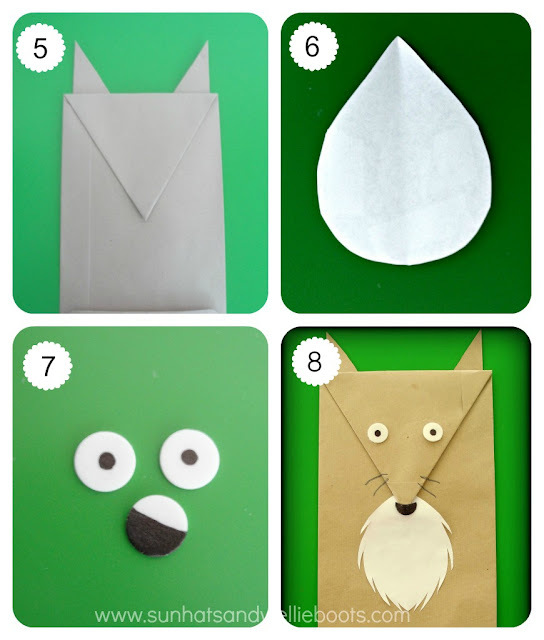 (6) To give the fox a white chest we cut a teardrop shape from white paper & feathered the edges to look a little like fur. (7) For eyes we decorated round stickers, & cut one sticker in half to make a nose. (8) We stuck them onto the envelope, along with the white chest, added some whiskers & he was almost ready to go. Our fox wouldn't be a fox without a tail, so using the open end of the envelop we cut off the seal & cut it into the shape of a tail. We then stuck it to the back of the puppet & glued on some strips of wool (brown, yellow, orange & red). Now our fox puppet was ready for play. He's been great for exploring emotions & language, inspiring storytelling & imaginative play, & has even been the star of a puppet show! Not bad for an old envelope! Minnie's since decorated her puppet with felt pens & lots more scraps of wool, so he's now one very colourful fluffy fox! The neat thing about this puppet is that he could be decorated with anything, great for encouraging self-expression & creativity. 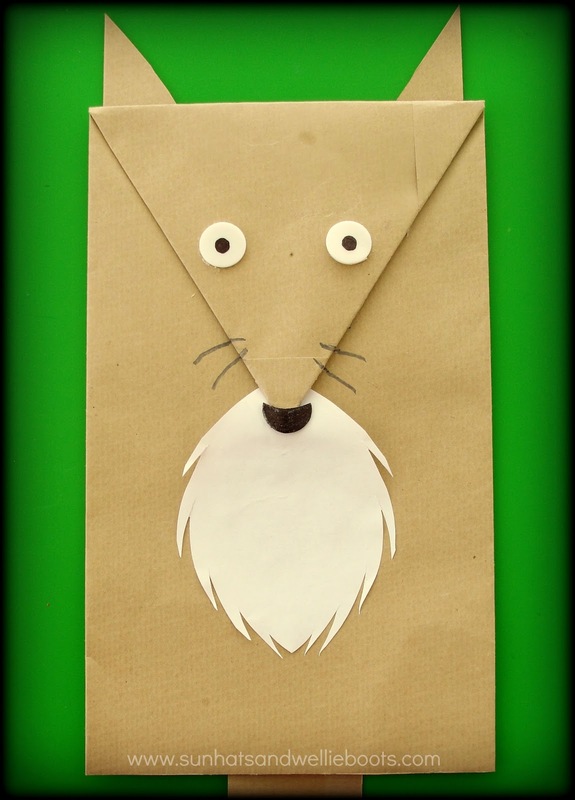 He's also been a popular accessory when we've read 'The Gruffalo', 'Ferdie and the Falling Leaves' & other favourite tales which feature foxes! Minnie has even made a fox's den for him which she's placed alongside her bed. With Christmas on my mind I couldn't help but make this cute Reindeer Envelope Puppet, made in the same way as the fox, but with the addition of antlers & a red nose. 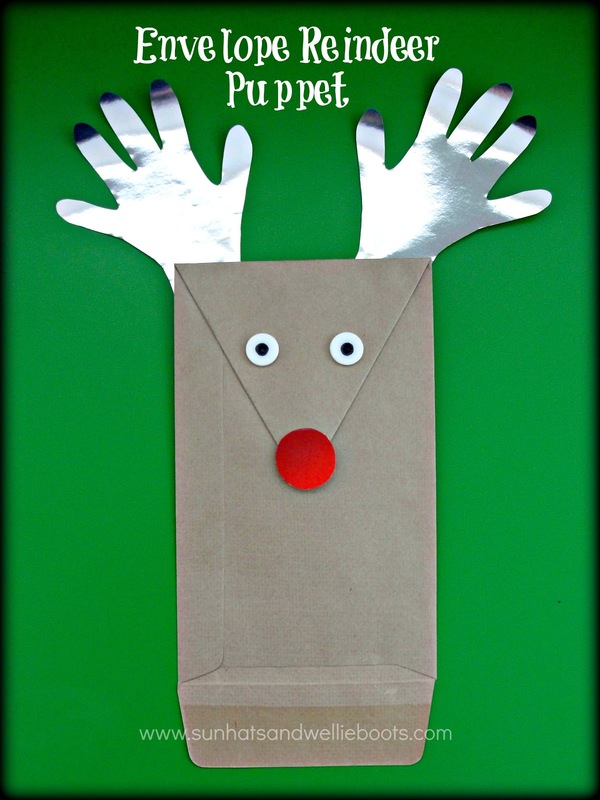 To make the antlers we drew around Minnie's hands on thin card, & once cut out we attached them to the back of the puppet. There you have it, one red-nosed Rudolph all ready to guide any Christmas sleigh!